about $2,200 with 10% down. If you can find one to rent, it will be $3,200/month. I think you better check your math. The 2,200/mo would be a rate of 4.25% and be just principal and interest on a 30yr fixed. Do you have PMI of any kind factored in? How about real estate taxes and homeowner's insurance? Upkeep and maintenance? This is unprecedented in history. What is unprecedented is the level of exaggeration in your posts. If they come out of college and can have a nice house with a $26,000 mortgage I think most would be happy. Unfortunately the average student loan for graduating seniors is $26,000 and the median home price is about 6 times that amount. I think this describes the OP. "The conventional wisdom is that mortgage delinquencies are falling because the economy is improving, borrowers are going back to work, and they are resuming payments on their mortgages. Unfortunately, reality bears little resemblance to this spin. In truth, almost no borrowers resumed making payments according to the original terms of their mortgage. 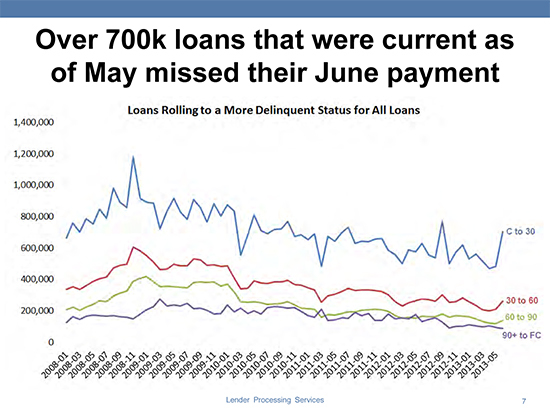 Delinquencies are falling because lenders are offering greatly reduced payments to squeeze a few more dollars out of debtors while everyone waits for prices to rise back to the peak. And despite lenders best efforts to make their loan modification deals too-good-to-be-true, nearly half of those given these loan modifications end up defaulting again." Let’s take a look at the trend in deleveraging. The total debt is dropping, that much is true. However, how do you think this really happened? Did Ponzis suddenly start making more money during the recession and pay it down with wage income. No. Did anyone liquidate their assets to pay off debt. Not very many. So what is the real source of deleveraging? Nearly all the mortgage debt retired over the last several years was written off by banks. Credit card write offs are up. 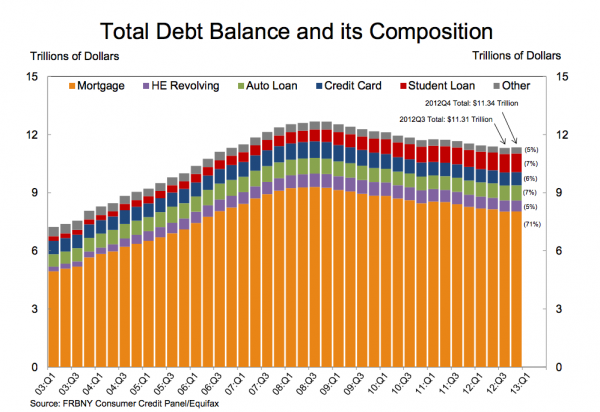 The reason why americans debt is down, is because banks are writing off more debt as unrecoverable. Good article I found. Nice to see someone using facts, not opinions. Who will "qualify" or afford to buy homes in the near future, especially as the baby boomers downsize? A college degree with a student loan the size of a mortgage and a job at Starbucks ain't going to cut it. When people make less, they can afford less this will push home prices down to a price people can afford. Good for buyers, bad for sellers. That first post is from 2011 and the second was just last month. I find it interesting that you're still talking about house prices declining even during one of the biggest upswings in history. Just in the past 12 months, house prices have increased 24.9% in Las Vegas according to Case-Shiller. Units in a highrise condo bldg in Miami Beach are selling for 40% higher than I paid for a similar unit just last fall. I'll probably sell one of my properties soon to lock in that profit. So much for that 10-15 year bear market that that individual predicted "using facts." Since you mention Case-Shiller in your argument that the bubble is over and we are in full recovery, perhaps you should be reading what Robert Shiller has been writing this summer. Here are a couple of pertinent articles. If Shiller, Peter Schiff and other economist that gave early warning on the housing bubble are correct we may still see what proves to be a 15-20-25 year bear market in housing (take a look at Japan). My personal opinion is that we may find that this threads initial prediction of a 15 year bear market was optimistic. So we're in another housing bubble, but we're also in a housing bear market that could last longer than 15 years? Read the articles. If you want it translated into stock market terms, the articles indicate we are in a cyclical bull market (new bubble) withing a secular bear market. Cyclical is the short term trend, secular is the long term trend.